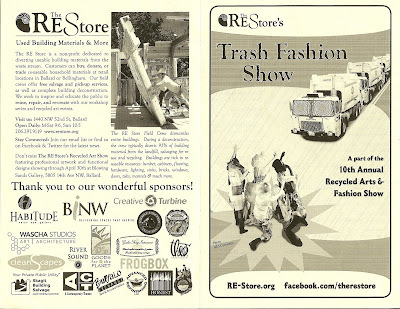 Some friends invited us along to the Trash Fashion Show, A part of the 10th Annual Recycled Arts & Fashion Show last night at the New York Fashion Academy in Ballard and we were glad they did because it was a fun show. 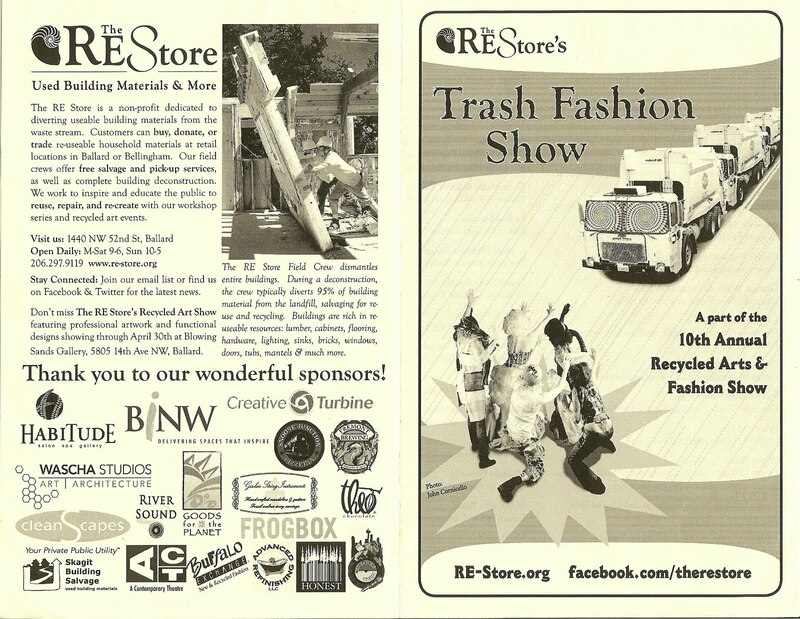 The fashion show is put on by the RE Store to bring the latest in trash fashion to the Northwest. The RE Store does many things, but primarily is a community-based non-profit that sells affordable building materials, much salvaged from old buildings. In the spirit of green, sustainable and RE-use the fashion show featured unique pieces made out of trash of all types. 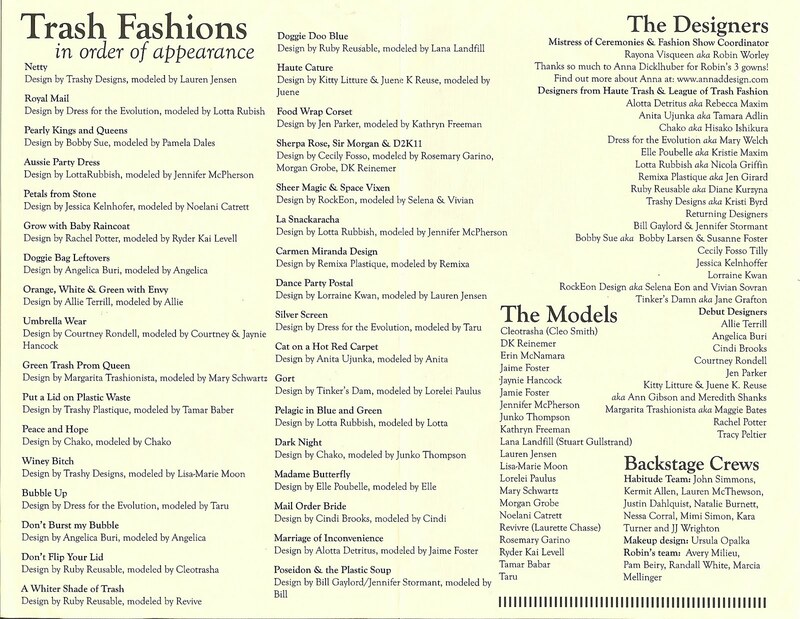 Each trashy entry paraded up and down the catwalk while the Mistress of Ceremonies read a tongue-in-cheek description of the outfit and its origins. In fact the puns were really rolling this evening including the stage names of the designers which included: Lotta Rubish, Remixa Plastique, Anita Ujunka, Margarita Trashionista, Ruby Reusable, Kitty Litture, Elle Poubelle, Alotta Detritus, and Rayona Visqueen (the Mistress of Ceremonies) to name a few. Some of the creations would not have been out of place at a so-called “real” fashion show. After watching this fashion show one can’t help but think differently of the Great Pacific Garbage Patch. Now, if only we had been thinking fashion when we ran into all the trash on the beaches at Torre Gauceto in Puglia! 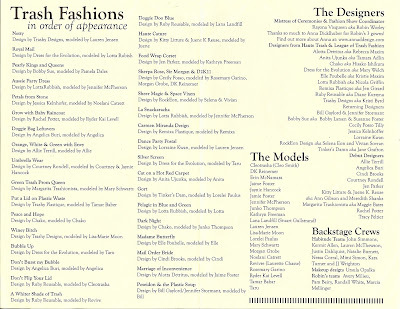 For the names of the designers and models of each creation shown in the following photos see the program guide included. Only about one half of the trash fashion creations are shown here. More are shown here. The name of the creation sometimes gives an idea of what type of trash went into creating the piece. But rest assured it's all trash! Of special note was the creation Marriage of Inconvenience made from the plastic wrap for medication used at the Bailey Boushay House. As detailed at Ruby Reusable the dress is made from "strips used at Bailey Boushay House for HIV suffers", each with black print on it that states the time of the day for the medication. The headdress is made from "plastic packaging, condoms, and syringes, draped with netting from Christmas trees and hardware and store packaging." Very powerful.